ADA adopted policy in 2005, later updated in 2016, on the use of opioids in the treatment of dental pain. The statement features a number of recommendations, including that dentists “should consider nonsteroidal anti-inflammatory analgesics as the first-line therapy for acute pain management.” A study in the April 2018 issue of The Journal of the American Dental Association (JADA) supports this recommendation, as its authors found that a combination of 400 mg of ibuprofen plus 1000 mg of acetaminophen was superior to any opioid-containing medications studied. Still, the epidemic has continued and opioids are currently a much-discussed topic in the media, on Capitol Hill and in towns all over the country. More than a hundred federal bills have been proposed to combat the crisis, and numerous states are considering legislation. Last week President Trump announced his plan to curb the epidemic. We are expecting legislators and their staffs to ask where the ADA stands on the issue at next month’s ADA Dentist and Student Lobby Day event in Washington, D.C.
With all of this in mind, the ADA today is implementing a new Interim Board Policy on Opioid Prescribing that could be the first of its kind among major healthcare professional organizations. 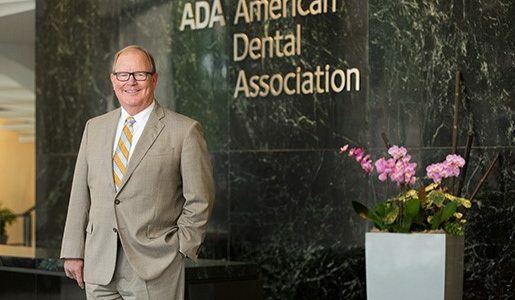 The policy demonstrates ADA’s firm commitment to help fight the country’s opioid epidemic while continuing to help patients manage dental pain.